Hanna Garth is a University of California President’s Postdoctoral Fellow in the Department of Anthropology at UC Irvine. 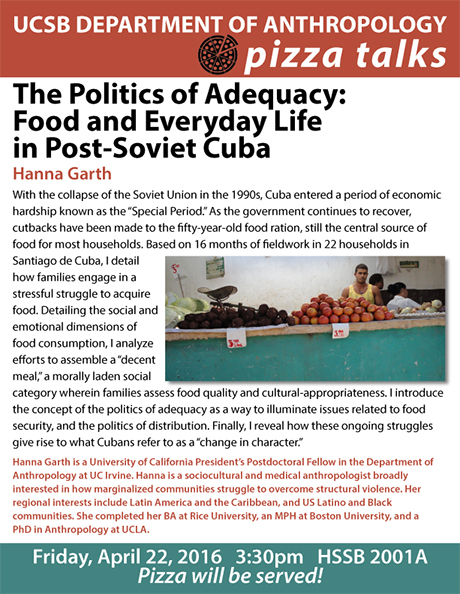 Hanna is a sociocultural and medical anthropologist broadly interested in how marginalized communities struggle to overcome structural violence. Her regional interests include Latin America and the Caribbean, and US Latino and Black communities. She completed her BA at Rice University, an MPH at Boston University, and a PhD in Anthropology at UCLA.